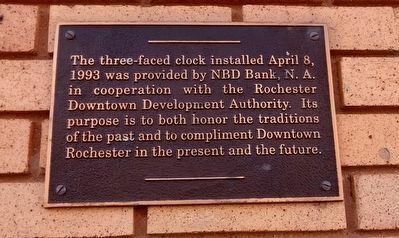 The three-faced clock installed April 8, 1993 was provided by NBD Bank, N.A. in cooperation with the Rochester Downtown Development Authority. Its purpose is to both honor the traditions of the past and to compliment Downtown Rochester in the present and the future. Location. 42° 40.837′ N, 83° 8.038′ W. Marker is in Rochester, Michigan, in Oakland County. Marker is at the intersection of South Main Street (State Highway 150) and West 4th Street on South Main Street. Touch for map. 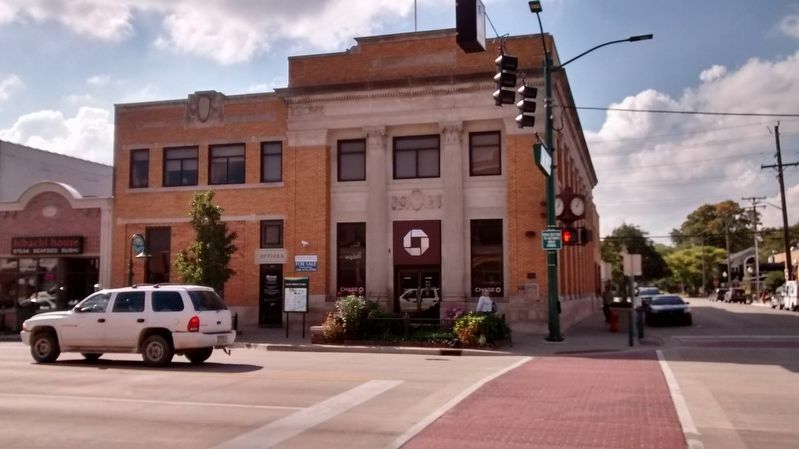 Marker is at or near this postal address: 339 South Main Street, Rochester MI 48307, United States of America. Touch for directions. Other nearby markers. At least 8 other markers are within walking distance of this marker. Rochester Opera House (within shouting distance of this marker); Masonic Block (within shouting distance of this marker); Rollin Sprague Building (about 400 feet away, measured in a direct line); City of Rochester, Michigan (about 600 feet away); Township Hall (about 600 feet away); Western Knitting Mills (about 700 feet away); George Vandeventer House (approx. 0.2 miles away); The Hammer (approx. 0.2 miles away). Touch for a list and map of all markers in Rochester. More. Search the internet for Three-faced Clock. Credits. This page was last revised on October 10, 2016. This page originally submitted on October 9, 2016, by Joel Seewald of Madison Heights, Michigan. This page has been viewed 155 times since then and 4 times this year. Photos: 1, 2. submitted on October 9, 2016, by Joel Seewald of Madison Heights, Michigan.